A bunch of cool images! The European Space Agency (ESA) today released more than a dozen Martian images taken by the camera on its Trace Gas Orbiter spacecraft. 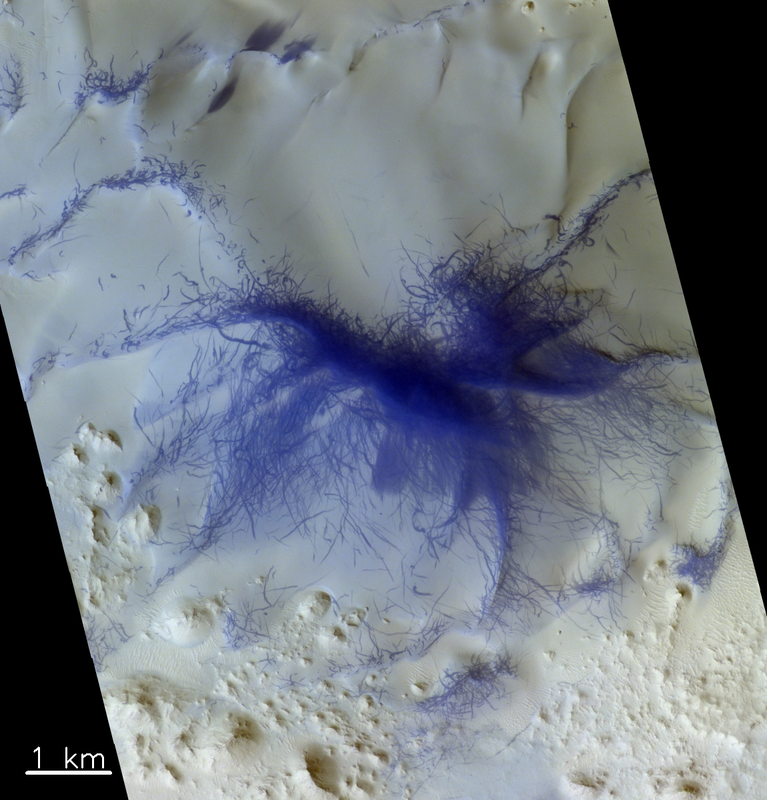 In addition to a snapshot of InSight and its landing area, “The images selected include detailed views of layered deposits in the polar regions, the dynamic nature of Mars dunes, and the surface effects of converging dust devils.” The release also included images showing details of two of Mars’ giant volcanoes, Olympus Mons and Ascraeus Mons. The image I have highlighted to the right, reduced to post here, shows a spot on Mars where for some unknown reason dust devils love to congregate. Below is a side-by-side comparison of this image (on the right) with a Mars Reconnaissance Orbiter (MRO) image taken in 2009 (on the left). The United Kingdom has named its rover for 2020 ExMars mission in honor of Rosalind Franklin, one of the scientists who contributed to the discovery of the helix structure of DNA. Franklin is best known for her work on the X-ray diffraction images of DNA. Her data was a part of the data used to formulate Crick and Watson’s 1953 hypothesis regarding the structure of DNA. Unpublished drafts of her papers show that she had determined the overall B-form of the DNA helix. Her work supported the hypothesis of Watson and Crick and was published third in the series of three DNA Nature articles. After finishing her portion of the DNA work, Franklin led pioneering work on the tobacco mosaic and polio viruses. Franklin died from ovarian cancer at the age of 37, four years before Crick, Watson and Wilkins were awarded the Nobel Prize in 1962 for their work on DNA.